Objective: In the Old Testament people looked for Jesus to come as their King. Name some stories in the Old Testament. Name as many of the Old Testament books as you can. Verse: Psalm 119:105 (KJV) - Thy word is a lamp unto my feet, and a light unto my path. and a- light- un-to my path. Thy word- is- a- lamp unto my feet. First part of the Bible, written first. Everything in the OT happened before Jesus was born (as a baby). God instructed the people to obey His law. Sadly they disobeyed Him over and over and over again! In the OT, people looked for Jesus' coming because He was the promised Savior. Take a hike at night. Start without using a flashlight. As you bump into things and have trouble walking ask the child what item would make the hike safer (light). Shine the flashlight on the path and discuss the difference the light makes. The Bible is compared to a light that can show us the right way to go. We need to listen to, read, and memorize the Bible so we can know what God wants us to do. God's Word shows us the rules we need to obey. 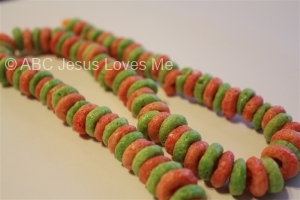 - Using fruit loops, start with a pile of one and add two. Continue with other small groups adding two at a time. - While looking at the Old Testament, discuss how the animals entered the ark by two's. Practice adding two's using the story of Noah. Using glue, start by making a cross and then an "x." Make a little circle and then a large circle. Sprinkle with glitter. Fold the Butterfly worksheet in half and open it back up. Drop paint around the fold line. Fold one side onto the other. Gently push the paint around to cover both sides of the butterfly. Carefully open the butterfly to see a mirror image. Cut celery into 2 inch pieces. Fill with peanut butter. Set raisins on the peanut butter to look like ants walking on a log. - Do a study of your state. Many Secretary of States' websites contain information and coloring books about the state just for kids. - Visit a local state park or historical place. - Find a coloring sheet of your state's outline by Googling your state name and "coloring sheet." Place a star on the coloring sheet where you live. Use the Qq Writing worksheet and for further learning check out the Letter Q Activities. Practice writing numbers 0-35 using the Write Numbers 0-35 worksheet. Fill in the missing numbers. - Personification is when an illustrator gives human traits (characteristics, qualities, emotions) to something nonhuman. In the story of Mike Mulligan and His Steam Shovel, Mary Anne the steam shovel is illustrated with facial expressions showing many emotions throughout the story. - Draw a nonhuman thing and personify it. - Mike Mulligan showed stewardship. He took care of what God gave him thus it lasted a long time. - Play with bulldozers, loaders, and large dump trucks in sand or dirt. - Hide small items in a tub of sand or beans. Pretend to be Mary Anne and find the hidden items.